Thanksgiving is just around the corner and I've been busy putting together three easy place settings for you to use on your Thanksgiving Table. For me Thanksgiving holds memories of simple pleasures gathered around our dining room table. Every year I look forward to this holiday, not only for the delicious food but for gathering together as a family, sharing, laughing and catching up on our life stories together. 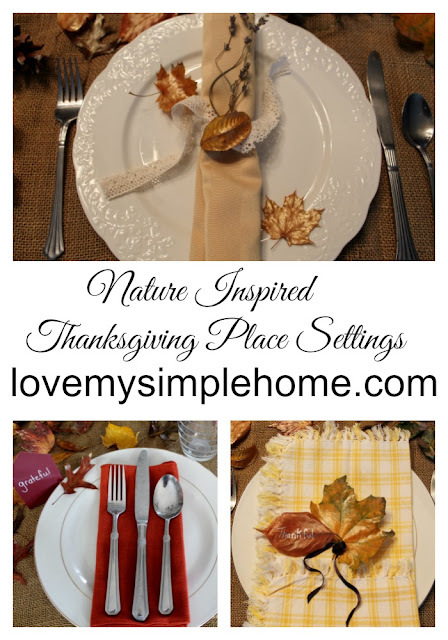 Today I will show you how you can put together three nature-inspired place settings without spending any money. All you need to do is look outside your window. I searched my backyard for colorful leaves and woody pine cones. You can even involve your kids in the search. When my daughter was younger I would tell her we were going on an adventure to search for treasures. To help you get started, I put each place setting under a different category. The first one is simple the second is pretty and the third is country. Choose which one fits your style and inspires you! I created the place card using paint sample cards. The cards have a triangular shape of a rooftop. To make yours simply fold and crease the bottom & write anything you would like, then stand the little house next to your plate. They are so adorable! I found the paint sample cards at Lowe's. Best of all they are free! Fold a cloth napkin lengthwise and place utensils on top. Scatter hand painted leaves around the place setting for a simple woodsy look. Click here for my tutorial on how to hand paint leaves. Roll a cloth napkin and tie with a crochet ribbon. Paint the leaves with metallic gold fabric paint and tuck a sprig of dried lavender under the ribbon. If you do not have lavender you can use any flower clipping. Place two leaves on the plate and one on top of the ribbon. Yellow gingham napkins add a country feel to this place setting. Tuck two painted leaves inside and tie with a black ribbon. Use a silver metallic sharpie to write on the leaves. For added texture and a more woodsy touch add a pine cone. I hope I inspired you to make your own natural place settings using any of my ideas! Get your free printable in my previous post on How To Set a Table, just click here to get yours! Julie ... thanks for sharing your lovely place settings. All are interesting ... hard to choose one. Love the use of natural things, leaves, pine cones and dried flowers. Writing on the painted leaves is such a great idea. Yes, I am inspired. Julie, loving all the tablesetting ideas! These a great for an everyday look or for Thanksgiving. 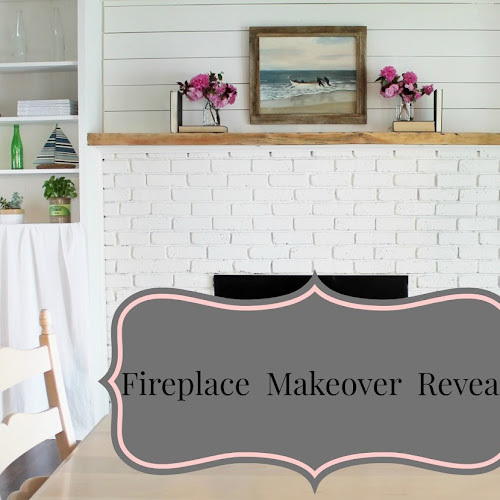 Thank you for sharing with us at the Your Home Decor and More link party! Can't wait to see what you share next month. Pinning and sharing. Thank you for such gorgeous Thanksgiving tablescapes, dear one!!! Menu is set. . .however, I can't say the same about our tablescape!!! You've given me much inspiration and direction for which I am grateful!!! This is such a great idea! I love bringing in natural elements...and the best part is that they are free!